^ "Ease of Doing Business in Croatia". Doingbusiness.org. Retrieved 21 November 2017. 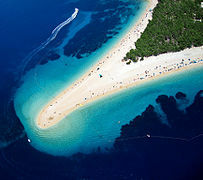 Gross domestic product (GDP) of the counties of Croatia significantly varies from one county to another as economic development of Croatia varies substantially between Croatia's geographic regions reflecting historic developments, infrastructure available, especially routes of transportation, and diverse geographic setting of various parts of the country, especially in respect of areas situated along the Adriatic Sea shores, where tourism represents a major source of income.